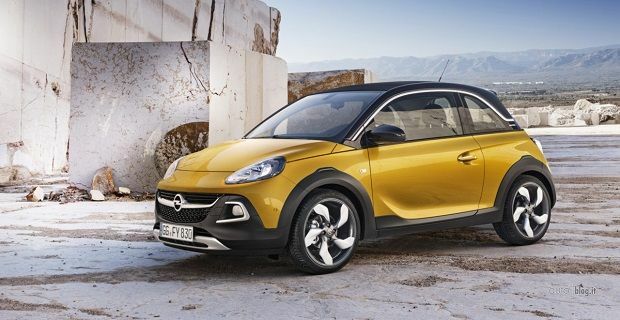 The Vauxhall Adam is rocking a new look that will be revealed in the flesh at next month’s Geneva Motor Show. The Vauxhall Adam Rocks offers both open-top motoring and mini-crossover looks. Adam Rocks concept was revealed in Geneva last year, but Vauxhall / Opel will use the 2014 Geneva Motor Show to unveil the production version. The newest Adam is designed for anyone with an “urban lifestyle” which basically means it remains a city car. The electronically operated retractable roof comes as standard, but it’s the signature body cladding and the 15mm additional ride height that make this an Adam Rocks. At 3.74 metres long this is the market’s only three-door mini-crossover under 4 metres, so it should appeal to drivers who feel that rivals like the Fiesta based Ford Ecosport and the 208 based Peugeot 2008 are too big. Individualisation is the buzz word surrounding this car, so you won’t be surprised to read that, along with the car’s new exterior design, the interior trim is also unique to this model. You’ll also get innovations like the hands-free park assist and the latest generation IntelliLink infotainment system which allows for Android and Apple iOS integration. Under the bonnet the Adam Rocks has Vauxhall’s all-new 1.0 litre ECOTEC direct injection turbocharged three-cylinder that offers 115bhp and 166Nm of torque. You’ll get 54.7mpg thanks in part of the highly efficient six-speed manual gearbox. If you like what you see, you’ll only have to wait until August to get your hands on one. We haven’t been told how much it will cost and we haven’t been given an exact release date, but Vauxhall has to keep something back for next month’s Geneva Motor Show launch.